Recently we published article on our blog about WordPress User Role Management explaining all the basic user roles and their main purpose. The follow up question is what WPBakery Page Builder can offer for different user groups and how features available in our page builder plugin gets managed across them. WPBakery Page Builder has inbuilt user group access management mechanism allowing to restrict usage of WPBakery Page Builder for specific user groups, including custom user roles, and post types. There was also an easy way to control WPBakery Page Builder element availability for different user roles. Nevertheless taking into account our research and feature requests from customers WPBakery Page Builder has moved into enhancing user role management options starting from version 4.8. From the upcoming version WPBakery Page Builder will allow easily control access to all general settings, features, tools and elements for user groups. What are the settings you will be able to control for user groups? With the help of advanced user role management you will now be able to completely align WPBakery Page Builder with specific user role responsibilities and skills they have. No more worries that people with non IT background could interact with layout and change global settings or use forbidden elements. Restricting access to advanced options for non IT users will significantly improve user experience as it will lower barrier for learning and usage of WPBakery Page Builder basic concepts. Allow content editors edit text blocks and images without changing layout or use templates without modifying them, allow or restrict anything you wish! Business owner, site administrator, freelance developer working on client project, blog owner or whoever – you will surely find new user role management amazing. I’m 100% sure you already can think of many ways on how you will benefit from WPBakery Page Builder user role management coming to you in just a few weeks. 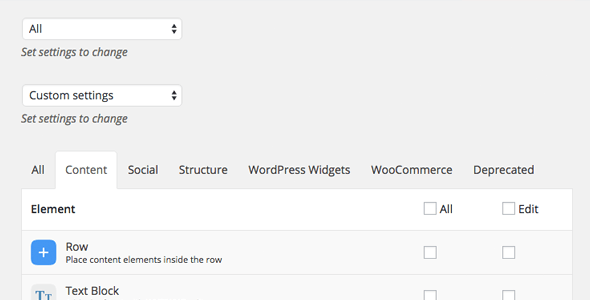 The first page builder plugin that adapts to your organizational structure not vice versa.